While I was on vacation we went to a wonderful little cafe called Whidbey Pies, Cafe & Catering. I had the Tuna and Havarti melt on toasted Banshee Bakery bread. Well, That’s the same sandwich I always order when we go there. I love their cafe, so cute and the food is fresh and tasty. I’m always impressed. And, this is my favorite sandwich there. I can’t get enough of it. I always mean to try something new, but once I’m there, I have to order that tasty sandwich. 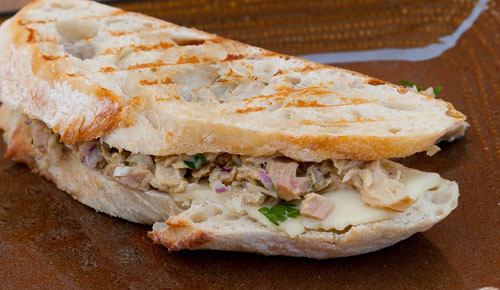 So, I thought I’d combine the taste of the Whidbey Cafe tuna melt with the Island Trollerstuna. 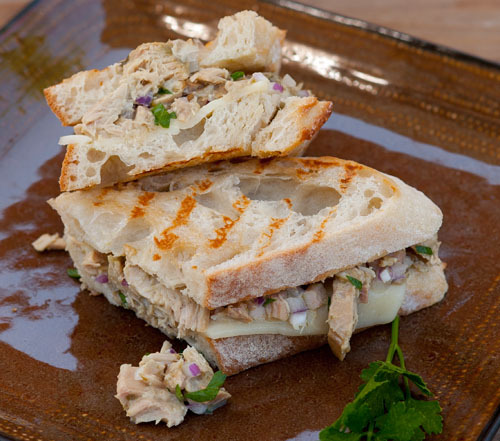 Here’s my version of that tasty sandwich treat using Island Trollers Albacore with Capers. 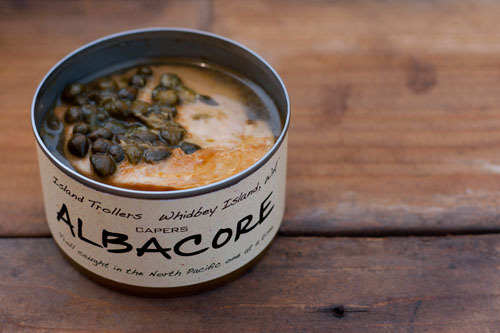 If you guessed that there would be real capers in the can with the tuna, you’d be right! So beautiful! And, I must say, this version comes pretty close, with the only major exception being their rustic bread that I can’t seem to find here at home. When making this type of sandwich, make sure you have a hearty bread, one that will toast up nicely. The toasting time in the pan will depend largely on your bread, so be sure to watch it as it cooks. You could also toast this in a Panini press if you have one. 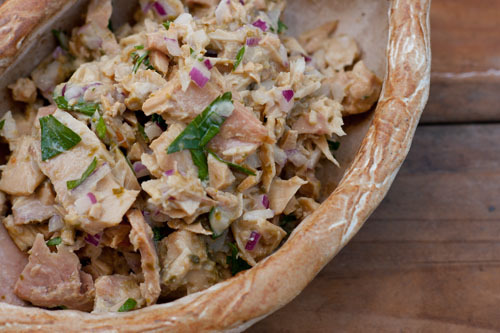 In a medium bowl, combine undrained tuna, chopped red onion, parsley, and mayo, flaking tuna as needed with a fork. Albacore tuna salad. This would be great inside an avocado or a tomato as well. Or, it was delicious just eaten with a fork! Spread tuna over one slice of sourdough bread (you probably won’t be able to get all the tuna on the sandwich, that’s ok, you can snack on the leftover tuna as you toast the sandwich). 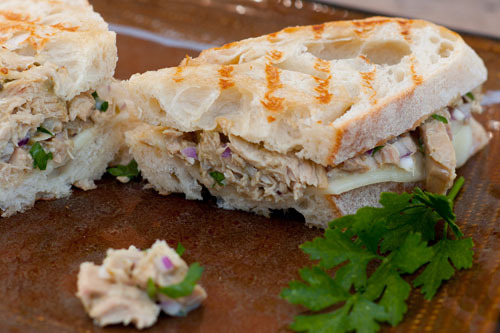 Top the tuna with sliced Havarti, and the last slice of bread. Heat a grill pan over medium-low heat. Once hot, spray the pan with olive oil, and place tuna sandwich in the pan. Allow the sandwich to toast and grill marks to develop, approximately 5-10 minutes of cooking. Spray top of sandwich with olive oil, and gently flip sandwich to allow grill marks to develop on the other side. Continue to cook for another 5 minutes until both sides are golden brown and crispy. Remove from pan and slice in half for serving. Enjoy immediately. Yummm. Fresh, tasty, and not ooozing with mayonnaise like some sandwiches. This is pure simple goodness. Another recipe for Island Trollers! 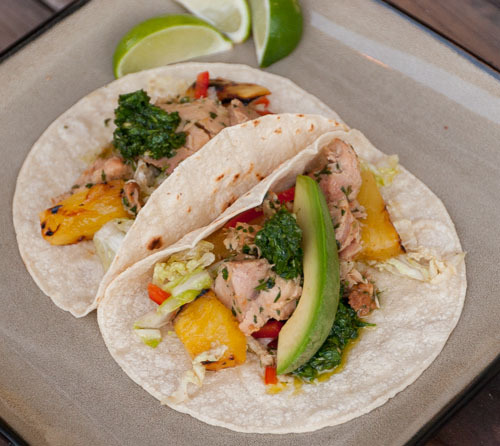 This time I used their habanero tuna to make habanero tuna tacos with chimichurri and grilled pineapple slaw. Ok, this was the first time I had ever eaten habanero. And, well, it’s hot. Check out the table of the scoville ratings for where different chiles land based on their heat. Habaneros are 10 times hotter than serranos! Did I mention that habanero is hot? I think this songby Buster Poindexter should be playing in the background. Island Trollers puts the actual chopped chile pepper right in the can with the tuna; see the little flecks of orange habanero on top! The grilled pineapple and the avocado help to tame the heat here. You could also use a bit of sour cream as well. I might try to use this habanero tuna in an enchilada next – like an enchilada Suiza with a creamy sauce. But, if you like hot and spicy, this habanero tuna was amazing! Spicy and hot. The tuna is so good that it held it’s own against the super spicy habanero. In this can of habanero tuna you get spicy and salty, yummy tuna goodness, and all those good-for-you omega 3s. If you don’t like hot food, use a can of Original Island Trollers Tuna; this would definitely be amazing, even with no heat. Look at those nice big chunks of tuna! Heat a small saucepan over medium heat. Once the pan is hot, add 2 tablespoons chimichurri sauce and 1 can Island Trollers tuna with all the juices. Using a wooden spoon, mix tuna and chimichurri together. Cook until warmed through, about 5 minutes. Place warmed tuna in a serving bowl. Place a dry cast iron skillet over high heat. Once the skillet is hot, place one tortilla at a time in the skillet, and toast tortilla until it begins to turn golden but is still soft, about 5 minutes per tortilla. Place bowls of tuna, remaining chimichurri sauce, pineapple slaw, and corn tortillas out for guests to make their own tacos. Also, place bowls of optional garnishes like avocado and sour cream out. In a small bowl, whisk together the first 5 ingredients (lime juice through olive oil), and set aside. 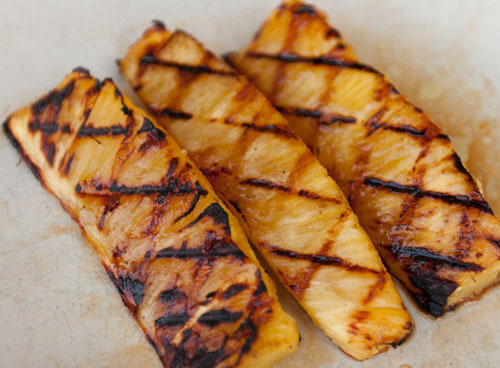 Grill pineapple spears over medium heat on a grill or in a grill pan on the stove until nice char marks appear. Allow pineapple to cool for 5-10 minutes. Slice pineapple into small chunks. Toss cabbage, red pepper, and pineapple chunks together in a large serving bowl. Dress with honey-lime dressing. Serve immediately. A few weeks ago I had the wonderful opportunity to purchase some tuna from Island Trollers. My husband and I stopped at Williams-Sonoma, and I noticed a beautiful can of tuna. I loved the fact that the label talked about how the tuna is troll caught one at a time (so sustainable!). It’s part of the Wild Pacific Albacore Campaign, an initiative of theWestern Fishboat Owners Association, and certified sustainable by the Marine Stewardship Council (MSC). I was really interested in the tuna and how sustainable it is, when my husband pointed out that the tuna is from Whidbey Island. Ok, now we had to buy a can of it! I love Whidbey Island (as many of you know)! You could just open one of their cans of tuna and eat it plain, straight out of the can and you’d be a happy camper! 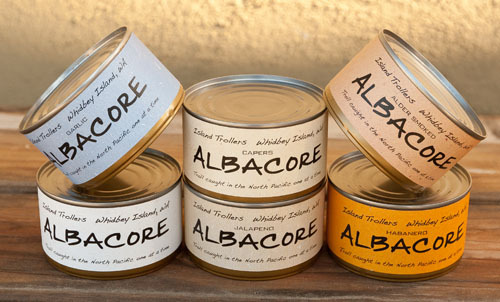 They had two flavors of tuna in the store: Albacore with Jalapeno and the Alder Smoked Albacore. We decided to get the Alder Smoked one. As we were checking out, the gentleman helping us told us about how the jalapeno was the best tuna he had ever had. He went on about the to-die-for sandwich he had that was made with this jalapeno tuna. I think he may have started drooling while he was telling us about it. He was so convincing that we decided to get one can of each flavor. And, it smells amazing! Like the sea. Like fresh fish. Like, well, tuna! And, the flavor? I’m sure you guessed by now that it was the best tuna I’ve ever had. It’s fresh, juicy, and full of flavor. I think I’m a lifelong convert. And I’ll only be able to eat this Island Trollers tuna from now on – no more grocery-store tuna for me. (If that makes me a tuna snob, I’m ok with that.) Seriously, do yourself a favor and get some of this tuna. They sell it on their website and in Williams-Sonoma’s stores. I’m checking with the company to see where else you can pick up their tuna. 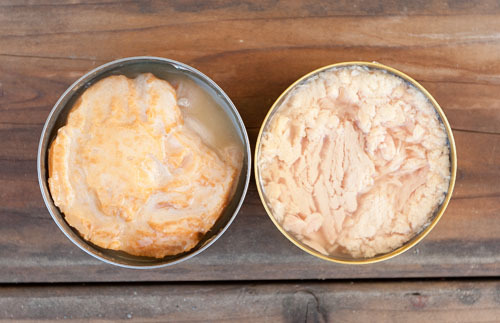 An open can of Island Trollers Albacore on the left, and a can of grocery store tuna on the right. You can see the difference right away. After eating the two cans of Island Trollers Albacore, I did a little looking at their website and saw that they had several delicious sounding flavors like Albacore with Habanero, Albacore with Garlic, and Albacore with Capers. All these flavors are really inspiring to me! Well, for that matter, the plain tuna was also really inspiring because of how delicious it is. So, to make a long story short, I’m now working with Island Trollers to come up with some recipes to showcase their tasty tuna. All the different flavors of tuna that Island Trollers makes. I can’t wait to try them all! I have so many ideas! Here are some that I want to try: maybe tuna with habanero served as a taco with goat cheese and fresh pico de gallo. 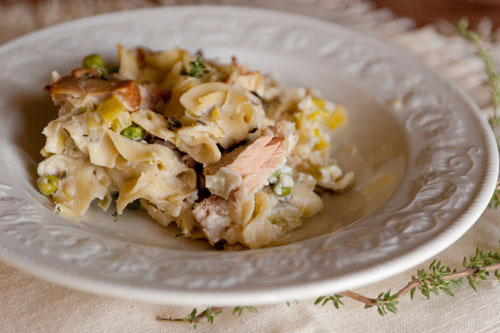 Or, maybe the Alder Smoked Tuna served as a tuna noodle casserole with smoked fresh mozzarella cheese. Or, maybe Greek style with the Caper Albacore, cucumbers, and Tatziki sauce. We’ll see what special tuna recipes come next. But, be sure that you’ll see several ideas. 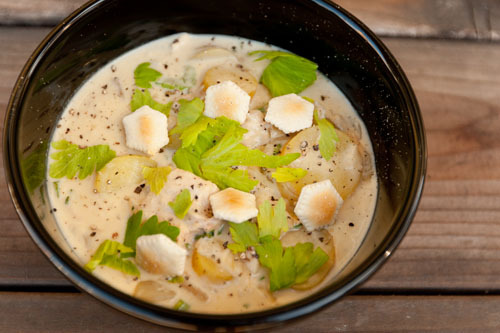 My first recipe for Island Trollers is Tuna Chowder. Fresh, tasty, not too heavy but still thick and rich with lots of flavor. I love clam chowder, but my husband isn’t fond of clams (too chewy and tough). So, this makes us both happy. In fact, it made all my tasters really happy. Definitely a chowder you could serve to company! Don’t let the long list of ingredients intimidate you either, the chowder comes together pretty easily. Thanks, Island Trollers, for this opportunity to work with you! I love what you do! Add the oil to a large stockpot and heat over medium-high heat. Once the oil is hot and begins to shimmer, add the onion, and cook, stirring occasionally, until the onion is softened and beginning to brown, about 20 minutes. Add the shallot and the garlic, and continue to cook until fragrant, about 1 minute. Whisk in the broth, and bring to a simmer. Cook for 5 minutes, stirring occasionally. The liquid should be the consistency of heavy cream. Add the bay leaf, fresh thyme, and wine. Add the potatoes and bring to a simmer. Cover, adjust the heat to maintain a gentle simmer and cook until the potatoes are tender when pierced with a fork, about 15-20 minutes. 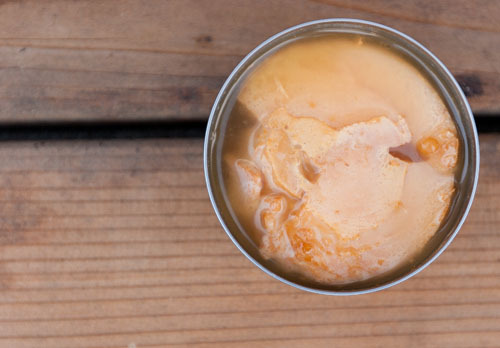 If you like your chowder really thick, transfer ½ cup of the chowder to a blender, and process until smooth. Return to the pan. If you like your chowder a little less thick, skip this blender step, and continue on with the recipe. Stir in the half-and-half, tuna with all its juices, celery, and black pepper. Bring the chowder back up to heat gently over medium-low. Taste for seasonings, adding more salt and pepper as desired. Remove bay leaf, and ladle into warmed soup bowls. Garnish with chives, freshly ground pepper, celery leaves, and oyster crackers. Enjoy immediately. *Cook’s Notes: Fingerling potatoes can be found in well-stocked grocery stores. 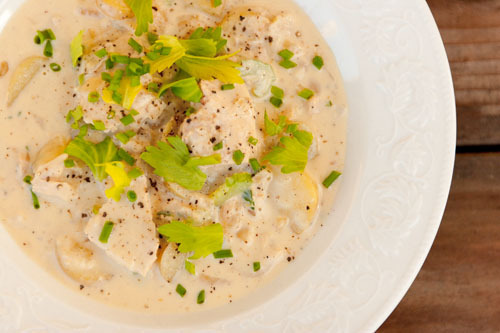 They work really well in this chowder because of their small size. If you can’t find fingerling potatoes, Yukon Gold potatoes may be used. Cut them into uniform dice, about ¼ to ½-inch in size. 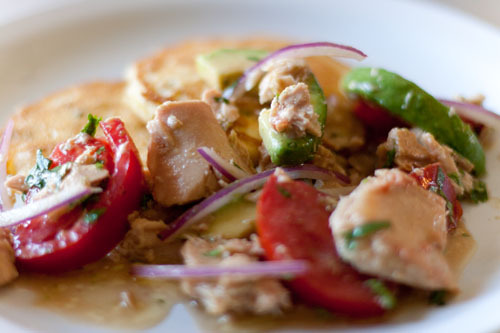 Summer is the perfect time for a no-cook salad made with Island Trollers Albacore. (Well, anytime is the perfect time for their tuna!) I served this summer salad with some fresh corn cakes. The essence of summer! Fresh, yummy, light. The corn cakes (which can be served hot or at room temperature) are really nice with this because they help soak up all the tasty juices. You’ll notice that I recommend not draining this tuna. That’s because of the way they cook it. It’s only cooked once. And, you can tell the difference when you open the can. It looks just like a fresh whole piece of fish. I choose the garlic Albacore with this, but any of their tuna flavors would be awesome. 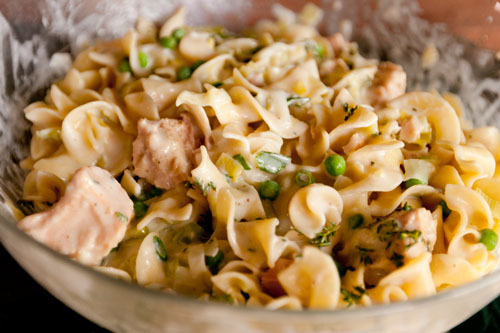 I’ll try this with the jalapeno Albacore as well. 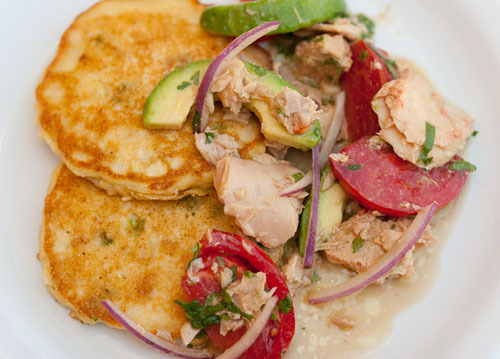 Sustainably caught, garlic Albacore Tuna from Island Trollers… YUM! If you’d like to read about how I got hooked (no pun intended) on Island Trollers, please read my Tuna Chowder post. It’s seriously the best tuna I’ve ever had. In a medium bowl , whisk egg and milk together. 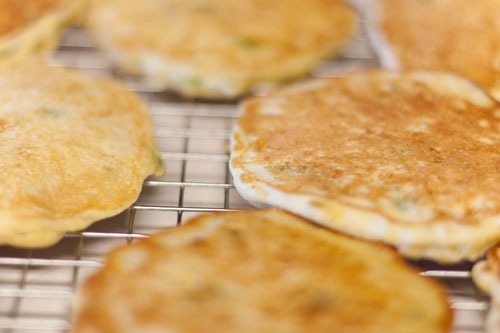 Stir in cornmeal, flour, salt, and baking powder, and fold in green onions and corn. Set a large non-stick frying pan or a large griddle over medium heat, and add 1 tablespoon oil. Scoop ¼-cup portions of batter into pan. Cook, turning once, until puffed and golden brown, about 6 minutes total. As the cooked cakes come off of the griddle, set them on a cooking rack. Repeat process with remaining batter, adding more oil as necessary to the pan. Place tuna in a medium bowl, and break apart any large chunks with a fork. Place the onion slices in a colander and rinse with cold water*. Add the onion, tomato, and avocado to the bowl with the tuna. In a separate small bowl, mix olive oil, lime juice, cilantro, salt, pepper, and cayenne pepper. Pour dressing over salad, and mix gently. *Rinsing the onion will remove its stinging bite and mellow the taste, making the onion sweeter. It will also help to make your eyes not water as the sulfates that irritate your eyes get rinsed away. To Serve: place two corn cakes on a plate, and scoop some summer salad on top. Garnish with chopped green onion, cilantro, or sour cream, if desired. Enjoy! When writing tuna recipes at some point you figure that you really need to do something traditional. Something that people think of when they think of tuna. Comfort food. 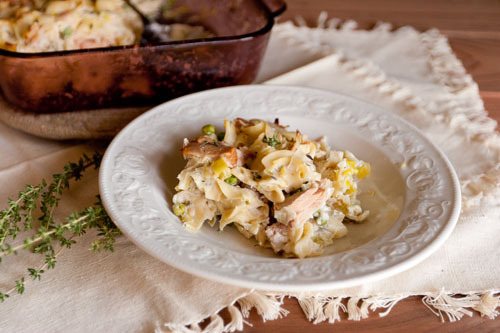 Yep, you guessed it… Tuna Noodle Casserole. But, I didn’t want gloppy cream of mushroom soup with tuna. No. And, no chips on top; no crumbled Ritz; no crispy stuff. I want fresh. I want tasty. I want real. Did I mention tasty?!?! They’re right. This is a sophisticated casserole. One that tastes like you took some time and put some love into it. I (of course) changed the recipe a bit. 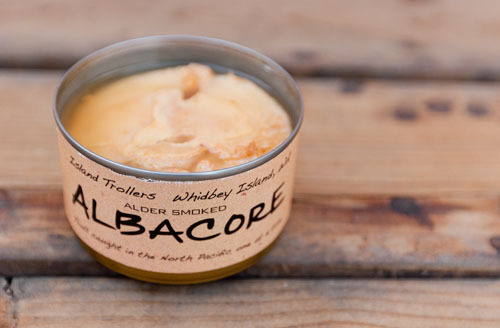 I wanted to use the Island Trollers Smoked Alder Pacific Albacore. And, I wanted to bump up that smokiness so I used smoked Fontina cheese. Sustainably caught one at a time in the beautiful waters of the North Pacific. Each can is raw packed and cooked only once. 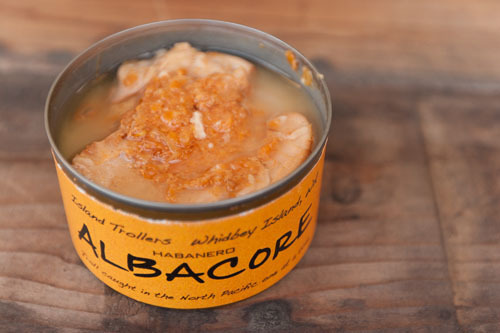 This is sushi grade albacore in a can, the finest you will find anywhere in the world. Really, I can explain this in one word, yum! It’s exactly what I wanted: comfort food that’s fresh and real with whole ingredients. 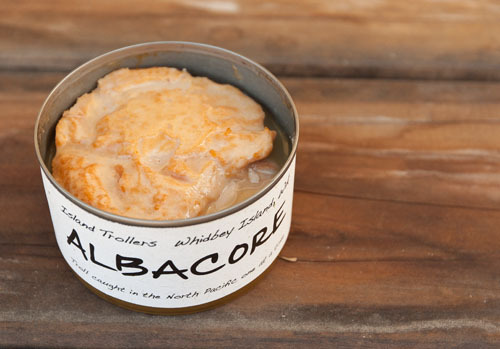 One that is good enough for Island Trollers Wild Pacific Albacore. Butter 8×8-inch glass baking dish. Set aside. Melt butter in heavy large saucepan over medium heat. Add leeks and ground celery seeds to saucepan; sprinkle lightly with coarse kosher salt. Cover saucepan and cook until leeks are tender but not brown, stirring often, about 8 minutes. Add flour; stir 1 minute. Gradually add milk and half and half; simmer until mixture thickens slightly, stirring often, about 5 minutes. Season leek sauce to taste with salt and pepper, and remove from heat. Meanwhile, cook egg noodles in large pot of boiling salted water until tender, stirring occasionally. Drain noodles, reserving ¾ cup noodle cooking liquid. Transfer noodles to large bowl. Pour leek sauce over noodles. Add grated Fontina cheese and thyme and stir to blend; Fold in tuna, breaking apart any large chunks. Fold in peas. If necessary, add reserved noodle cooking liquid one tablespoon at a time, until mixture is moist and creamy. Transfer to prepared baking dish. DO AHEAD: Can be made 1 day ahead. Cool slightly. Chill uncovered until cold, then cover with foil and keep refrigerated. Preheat oven to 375°F. Bake noodle casserole, covered with foil, until heated through, about 20 minutes if freshly made or 30 minutes if chilled. Remove foil. Continue to bake, uncovered, until top is golden brown and filling is bubbling, about 10 minutes longer. Serve hot. Enjoy! P.S. My father-in-law says that the true test of a good dish is the leftovers. If the leftovers are good cold, then the dish is great! And, I can say with full certainty that this was great straight out of the fridge. I was going to heat it up, but by the time I got through taste testing, the leftover were all gone.